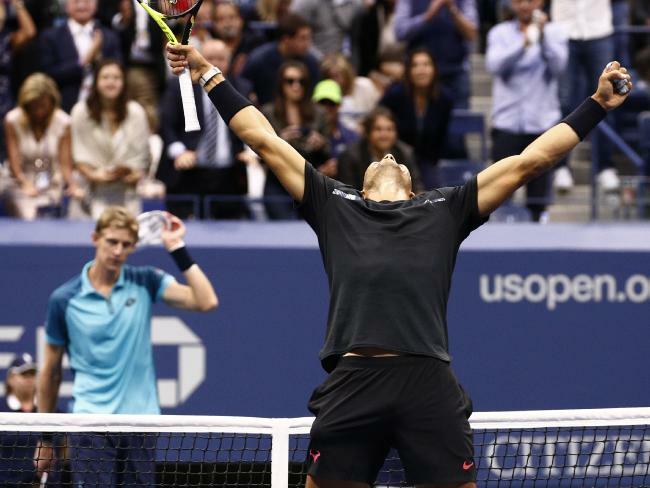 New York: RAFAEL Nadal overwhelmed first-time major finalist Kevin Anderson 6-3, 6-3, 6-4 on Sunday to win his third U.S. Open championship. It is Nadal’s second Grand Slam title of the year and 16th of his career. Only his longtime rival Roger Federer, who won this year’s Austalian Open and Wimbledon titles, has more, with 19. At No. 32, Anderson was the lowest-ranked U.S. Open men’s finalist since the ATP computer rankings began 44 years ago. He had never before been past the quarterfinals at any major tournament in 33 tries. The matchup shaped up as a mismatch and that’s exactly what it was. The No. 1-ranked Nadal dominated every facet of the two-hour final. He broke the 6-foot-8 (1.98-meter) Anderson’s big serve four times and never faced a break point himself. “Congratulations to Kevin, you have been a great example for so many people, tough injuries and you came back,” Nadal said after the match. “For me, personally this is unbelievable what has happened this year, it has been a high level of tennis. “This is an event that brings me to an even higher energy. I’m so, so happy. The final was particularly emotional for Nadal’s Uncle Toni who has coached him throughout his career. The New York tournament marked his final event by his nephew’s side. 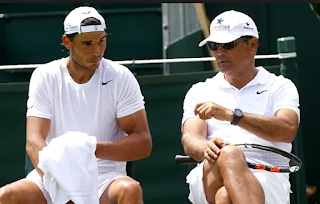 Paying tribute, Nadal said: “I cannot thank him enough for everything he has done, without him I would probably never have been playing tennis. Not since Pete Sampras at Wimbledon in 2000 had a man won a major tournament without facing any opponents ranked in the top 20. Plus, Nadal did not need to deal with Federer: The potential for a semi-final, which would have been their first US Open meeting, was dashed when Juan Martin del Potro eliminated Federer in the quarter-finals. Nadal then beat del Potro, the 2009 champion but now ranked 28th, in the semis. Nadal improved to 16-7 in Grand Slam finals. For the first time since 2013, he appeared in three in a single season, losing to Federer at the Australian Open in January, then beating Stan Wawrinka for his record 10th French Open trophy in June. Rafa wishing his best to all the victims of the hurricanes battering different parts of the world. "Be strong"
I cannot thank him enough for everything he has done, without him I would probably never have been playing tennis. It's amazing I had someone like him pushing me all the time. Because of him I got through all of my injury problems. He is for sure one of the most important people in my life. m so, so happy. Thank you to everyone, my family and my team and to everyone that makes this possible.